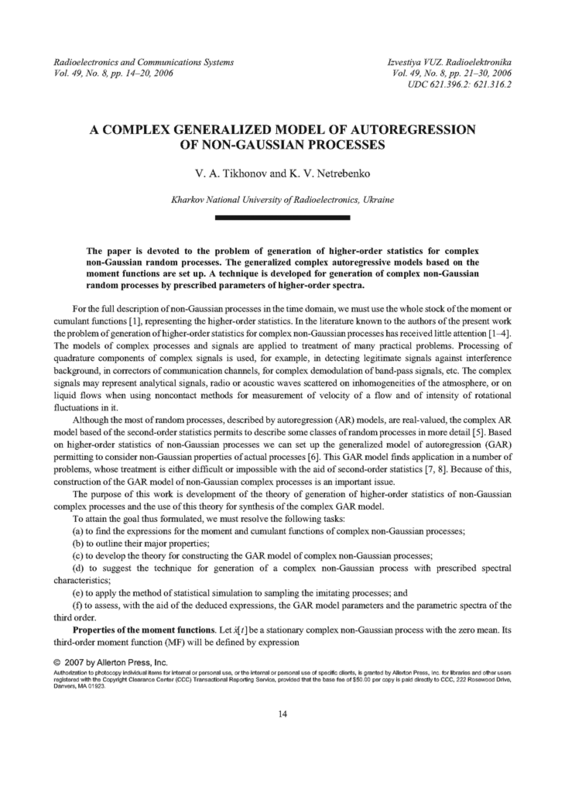 The paper is devoted to the problem of generation of higher-order statistics for complex non-Gaussian random processes. The generalized complex autoregressive models based on the moment functions are set up. A technique is developed for generation of complex non-Gaussian random processes by prescribed parameters of higher-order spectra. TIKHONOV, V.I. Statistical Radio-Engineering [in Russian]. Moscow: Sov. Radio, 1966. BRILLINGER, D.R. Time Series: Data Analysis and Theory. Holt, Rinehart, 1975. ZHURBENKO, I.G. Analysis of Stationary and Homogeneous Random Systems [in Russian]. Moscow: Izd. Mosk. Un-ta, 1987. KUNCHENKO, Y.P. Nonlinear Estimation of Parameters of Non-Gaussian Radio-Engineering Signals [in Russian]. Kiev: Vyshcha Shkola, 1987. MARPLE Jr., S.L. Digital Spectral Analysis with Applications. Prentice-Hall, 1987. TIKHONOV, V.A. "Obobshchennaia model avtoregressii negaussovykh protcessov," Radiotekhnika (Kharkiv), n.132, p.78-82, 2003. TIKHONOV, V.A. ; NETREBENKO, K.V. "Parametric estimation of the third-order spectra of the mixture of a non-Gaussian signal and Gaussian correlated interference," Radioelectron. Commun Syst., v.48, n.2, p.24-29, 2005. URI: http://radioelektronika.org/article/view/S0735272705020044. SIDOROV, G.I. ; TIKHONOV, V.A. ; SAVCHENKO, I.V. ; NETREBENKO, K.V. "Vyravnivanie amplitudno-chastotnoi harakteristiki kanala sviazi v prisutstvii moshchnykh gaussovykh pomekh," Radiotekhnika (Kharkiv), n.140, p.127-133, 2005. MALAKHOV, A.N. Cumulant Analysis of Random Non-Gaussian Processes and of Their Transforms [in Russian]. Moscow: Sov. Radio, 1978. TIKHONOV, V.A. ; NETREBENKO, K.V. "Parametricheskoe ocenivanie spektrov vysshikh poriadkov negaussovykh protcessov," ASU i Pribory Avtomatiki, n.127, p.68-73, 2004. TIKHONOV, V.A. ; RUSANOVSKII, D.Y. ; TIKHONOV, D.V. "Generatciia uzkopolosnykh imitatcionnykh sluchainykh protcessov," Radioelektronika i Informatika, n.4, p.83-85, 1999. FILIPOV, A.F. Collection of Tasks on Differential Equations — A Textbook for Higher School [in Russian], 6th ed. Moscow: Nauka, 1985.